You’ve all heard me talk about my struggles with taking care of my hair. I’ve shared with you some of the issues I’ve run into when trying to keep my color looking it’s best. And over the last six weeks, I’ve been trying something different. I’ve been testing out a way to care for my color treated hair that doesn’t require frequent trips to the salon. While this is a sponsored post for SheSpeaks/Pantene Platinum at Sam’s Club, all opinions are my own. A little over six weeks ago I shared with you the struggles I face when trying to care for my color treated hear. I told you about how I’ve changed hair colors and am trying to disguise the grey that seems to be creeping up every single day. And more so than any other time of the year, I really struggle with keeping my hair color looking good in the summer. I mean, let’s face it, between the kids being out of school and summer travel, I HAVE to stretch my trips to the salon even more and with color-treating hair, that can be a challenge. After all, coloring my hair leaves it weak and prone to damage! But this year I’ve been doing things differently. Instead of using the shampoos I’ve tried in the past, I’ve changed things up and have been using Pantene’s Platinum Color Lock System from Sam’s Club. Why you ask? Because the antioxidants in this system work from the hair’s core to help protect against fade-causing damage and protect color, all while providing a soft, radiant shine! So are you ready to see my results? Before I tell you how Pantene’s Platinum Color Lock System has worked for me, let me share with you how using it has simplified my life. I’ll admit that I’m the type that has a thousand products in the shower. But with Pantene’s Platinum Color Lock System, I know I only need one shampoo and one conditioner for my color treated hair. And since the bottles come in a larger 40 ounce size from Sam’s Club, they last longer so I don’t have to worry about running out when I need to shampoo and conditions for my color treated hair the most. But it doesn’t stop there! 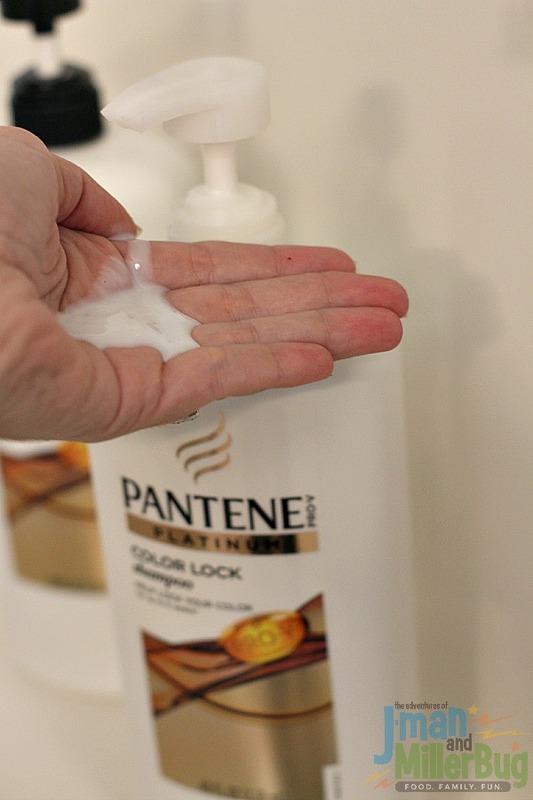 With a pump spout, I’m not wasting my Pantene’s Platinum Color Lock System shampoo and conditioner! Instead, I’m being able to quickly and easily dispense exactly the amount I need to keep my hair looking and feeling it’s best by washing it with Pantene daily! But, convenience would mean nothing without the added bonus of how well Pantene works! 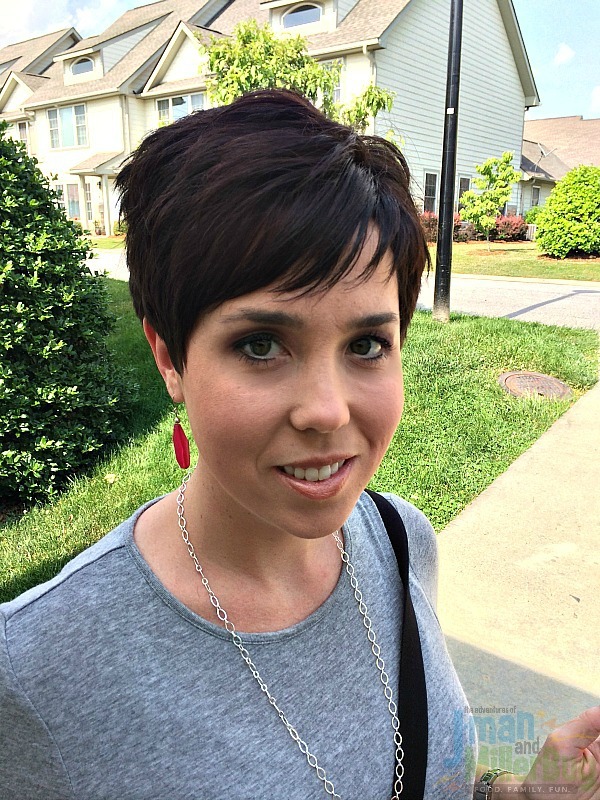 Over the past six weeks, I’ve noticed that my hair has not gotten the dull texture that often accompanies colored hair a few weeks after treatment. Instead it has stayed bright and beautiful and the color has remained vibrant! And I credit this very welcome change to my color treated hair to Pantene’s Premium Color Lock System! With Nutri-Lock technology, this system works from the hair’s core to help provide color protection for up to six weeks! Where before I had to seek out sunlight when taking picture because of the shine it would give my hair, I now can take those same images everywhere with the confidence that my hair looks shiny, healthy and vibrant because I know my shampoo and conditioner help fight color fade as well as the $40 leading professional brands (*based on Kline sales data). 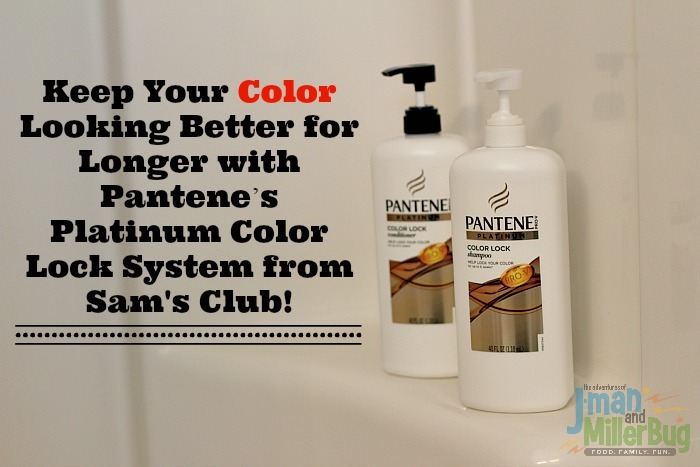 In the past I would never have considered giving up my salon products but after trying Pantene’s Platinum Color Lock System I know that there is a better way to care for my color treated hair. Going forward I’ll be trusting my color in between trips to the salon to Pantene knowing that I will get results I love each and every time. If you have color treated hair, stop giving it anything but the best! Head to Sam’s Club today to pick up Pantene’s Platinum Color Lock System shampoo and conditioner in the larger 40 ounce sized pump bottle. Then give you hair the moisture and care it needs each and every day to look gorgeous no matter what color it happens to be! 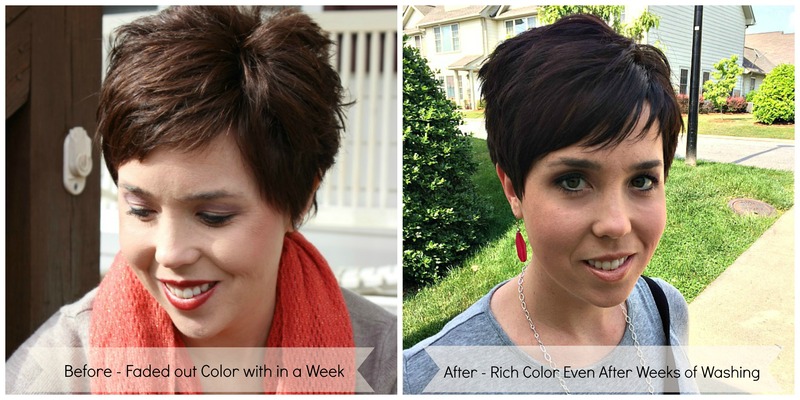 Tell me, why is keeping your color treated hair looking it’s best important to you? Oh I’m so tired of my colored hair fading so quickly! I need to try this! I miss my vibrant colors! yes! everyone loves that fresh from the salon look, especially when you pay those salon prices, so being able to keep your hair color vibrant is a total must in my book. thanks for sharing!! It’s an investment just like anything else. You have to protect it as much as you can. I like the results you got from this. My color tends to wash out pretty quick near the roots…where I need t most. My color usually lasts 6-8 weeks, which I think is pretty good for a box of hair color. Your hair looks great! Love the color! I haven’t dyed my hair since high school. I am always scared I’ll mess it up so I’ll play when they grey comes. The color did stay really vibrant! I need to try Pantene for myself, so I can stretch out my color also. This is what I use! I have always loved Pantene! Wow, what a difference! You hair looks great! We use Pantene and love it! I haven’t colored my hair in years but if I did, I certainly would want it to last longer than a week or two. 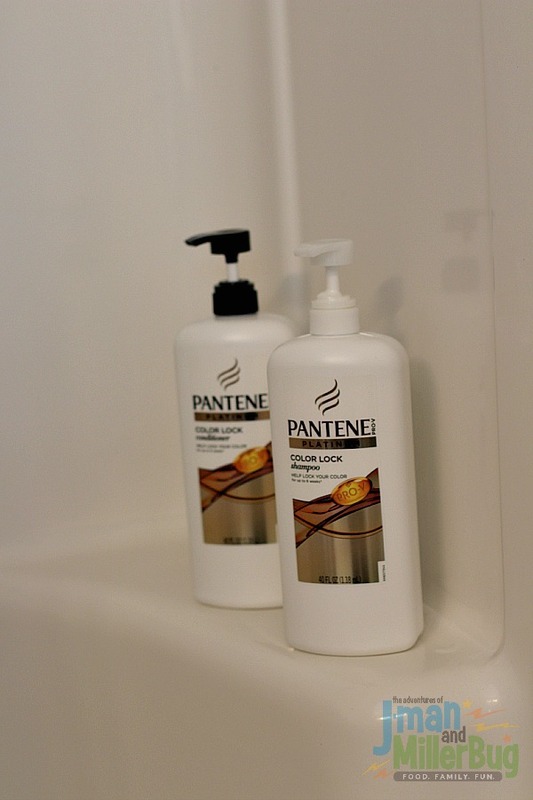 Your hair looks so good with this Pantene shampoo and conditioner! Wow that is amazing how it locks in the color. The few times I colored my hair I gated how quick it faded. You can clearly see the difference. I am a huge fan of Pantene products. After taking the time to color my hair, I don’t want it fading any time soon. Thanks for sharing this with us. Wow what a difference. I love using Pantene and didn’t know they had a color lock shampoo. I will keep this product in mind if I start coloring my hair. Looks like you have had great results. Your hair color is beautiful! I do have color-treated hair, so I’ll be looking for these Pantene products!! I love the darker color your hair is now! Wow! What a great comparison picture! I definitely need to try this out becuase my hair color fades so quickly with my texture. Salon products are so darn expensive and I used to use Pantene before I switched. I will definitely try to try this on my colored hair! Pantene is a brand I’ve used on and off for years. I think it’s always good to switch things up a bit. Your hair looks great by the way! I have never colored my hair, but if I did I would sure use Pantene. It has done a marvelous job of keeping your hair beautiful. I color my hair! I used to use Pantene all the time. I need to switch back! Your hair looks amazing! I should look into this! I love Pantene! Started using their products right after high school and nothing else will do for me. I just love your short hair! It looks great on you!